Much Better than a Crowbar! Designed to engage the grab-handle of tank car manway covers. Five-foot steel pipe handle and a rocking foot provide the leverage to overcome suction caused by the difference in atmospheric pressure outside the tank car and inside. 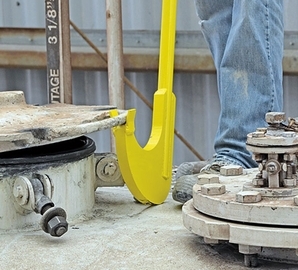 When using the pry bar, the worker can stand upright and avoid the escaping fumes when the lid pops free.